Nancy, Steve, Rachael and Russ Walker with Greg and Charlotte Sonnenfeld and Claire and Richard Walker. Richard Walker finds his parents to be particularly difficult to shop for. So, when he wanted to find a special way to celebrate their retirement, he was stumped. Walker reached out to his siblings, Russ and Charlotte, for help. 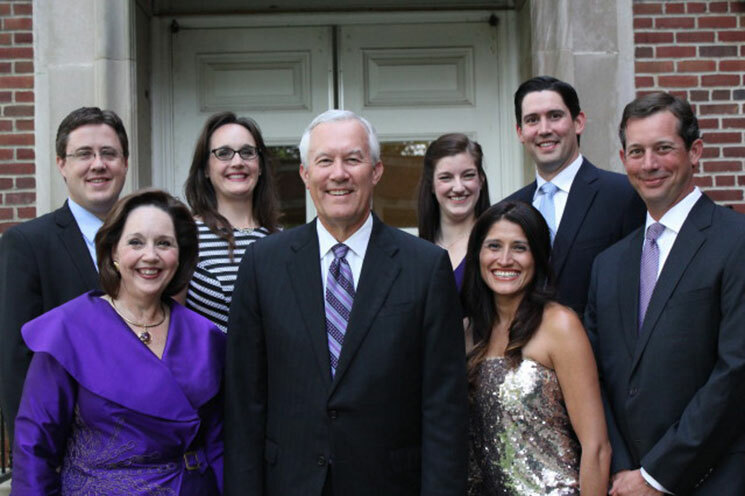 Together with their spouses, the three Walker children decided to establish a scholarship at LSU in their parents’ honor. The Steve and Nancy Walker Endowed Scholarship was half-funded when they presented it to their parents last Thanksgiving. Touched by the gift, and eager to help students, Steve and Nancy matched their contributions. The now fully funded scholarship will benefit students studying business or education—a reflection of Steve’s and Nancy’s respective LSU degrees.